David Datuna is a Georgian-born American artist (b. 1974, Tbilisi) now living in New York. Over the past several years Datuna’s noted series, Viewpoint of Millions, established his signature technique of laying a cascading veil of varying optical lenses over an intricate, multi-dimensional narrative. 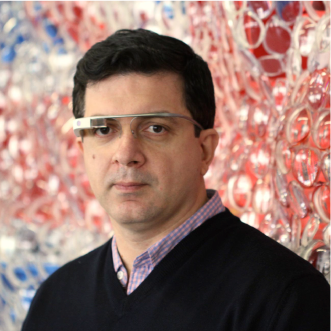 In December 2013 David Datuna became the first artist in the world to utilize Google Glass in a contemporary work of art with Portrait of America from his Viewpoint of Billions series. Portrait of America debuted during Art Basel 2013 at The New World Symphony, then headed to Lincoln Center in New York City. In February 2014 the Smithsonian’s National Portrait Gallery featured Portrait of America during Presidents’ Day weekend, expanding the definition of a 21st Century portrait. David Datuna’s mixed media sculptures have received critical acclaim on three continents for over a decade, merging elements of conceptual and pop art, creating a thoughtful and visionary body of work. David has continued to press the boundaries of art in exploring how we perceive cultural identity as individuals, social groups, even nations. He explores the meaning and sources of complex cultural identity through a conceptual iconography based on symbols, flags and logos. Lying beneath the undulating surface of eyewear fused together to create a prismatic surface, is a fragmented layer of collaged Images and text harvested from political, cultural and social publications. Datuna’s objects stand in witness to the history and powerful status of the celebrated emblems captured, distilled and subsequently reflected back to us for personal re-examination. His artwork pays tribute both to Jasper Johns’ series of American flags and to the exploitation of the found object and collage tradition. Yet perhaps more powerfully, it imbues timeless images with new meanings by anchoring them both in the present and in their rich history. Structurally, the eyeglasses are a symbolic expression of identity, illusion, perception, fragmentation and unification. From a distance the sculptures can be seen as a kaleidoscopic image that unifies the whole as a symbol; on closer inspection the viewer can discern collaged books and newspapers with headlines of political and social culture, along with pop culture images of celebrities, innovators and leaders that dared to be different. The themes provide not opinion, but a roadmap to identity and history, encouraging people to thoughtfully consider, ponder and respect individual viewpoints from unique points of view.